A circle or oval, of 10 to 20 meters in diameter, with stone walls and a conical and slanted roof composed of stalks of rye. Intended to house and shelter cattle, its structure was ideal to withstand the harsh winters. The Palloza is pre-Roman, presumably Celtic. 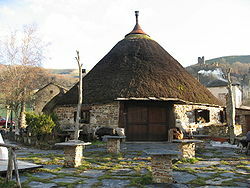 Pallozas have similarities with the round houses of the Iron Age in Great Britain and the buildings of the Castro culture. The village of Asterix is composed in part by pallozas. Castro of Chano (municipality of Peranzanes (Province of León). Detail of one of the buildings. Inside can see the home. Its name is actually a corruption of the Galician word "pallaza", first used in the late 19th century by ethnographers such as German Fritz Krüger, who was referring to the material used to make the roof. The traditional name of these buildings is in fact casa de teito or casa de teitu. The word "palloza" (spelled palhoça) is also used in the Portuguese language, where it describes a type of small cabin built with wood and thatched roof. Municipal palloza in Balboa (León). It is used as bar and restaurant. 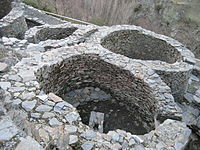 Pallozas were used until the second half of the 20th century, when improved communications brought modern building concepts to the area. Pallozas survive in Galicia, comarca of Os Ancares, and in several areas of Candín and western Asturias. The remarkable pallozas in the Bierzan town of Campo del Agua was largely destroyed by a fire in the mid 1980s. The most famous may be that of Piornedo, which since the 1970s has been an ethnographic museum. New pallozas are used mainly as holiday homes, even in remote areas, where they were not traditionally used. Wikimedia Commons has media related to Pallozas.